I woke up today being especially appreciative of everyone who supports my business in any way. Thank you for being here. 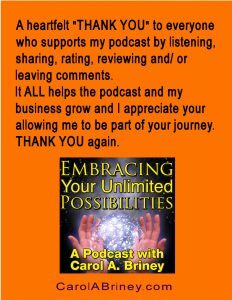 Thank you for supporting my podcast. Thank you for supporting my newsletter. Thank you for supporting my speaking. Thank you for ALL the sharing and comments. My business is growing in part because you were kind enough to share the things that you like. I appreciate you so much. But mostly, thank you for allowing me to be part of your journey.